Neck is one of the most important guitar parts. Each guitar types has different demands on neck construction. Material, neck make-up, used reinforcement, thickness and shape, head and heel angles and many others. Maple - especially Canadian Rock Maple - is used for electric, bass and archtop guitar necks. Mahogany - characteristic acoustic guitar neck material. Used for electric and bass guitars the most frequently with glued or through necks. Walnut - gypsy guitars, acoustic guitars occasionally. Cedar (Spanish or Brazilian) - favoured material for nylon string guitars only. Other materials are used less commonly - except bass guitars. There are used lot of woods (mostly exotic) depends on required acoustic characteristics. Alder, beech, Indonesian, Asian or African woods similar to Mahogany are used for poor quality guitars. Each of forenamed woods has really different mechanical performance and acoustic characteristics. 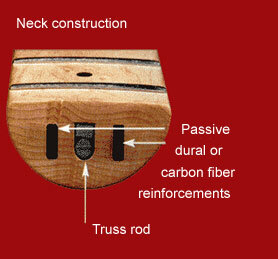 There are two aspects at neck thickness - stability and acoustic characteristics. Massive necks facilitate fundamental frequencies and sustain. The sound is full and concrete. Thin subtle necks have opposite characteristics. These necks are comfortable but it is usable at guitars designed for distortion and processor playing. Maple - has short wood fibres. It results in local torsion and wolf tones appearance. It concerns electric and bass guitars with bolt on neck in most cases. Archtop and acoustic guitars (as well as through neck electric and bass guitars) aren´t prone to problems as many. Specific tone characteristics makes Maple very popular neck wood no matter the negative qualities. Mahogany is preferable wood to the acoustic guitars. Mahogany - has very long straight wood fibres which make the wood resistant to torsion and wolf tones. Very long sustain is typical of all kinds of Mahogany. Sapele, Khaya and Sipo Mahogany are used most often. Each of Mahogany types have very specific tone characteristics which may not be suitable for each type of guitar. Cedro - is very lightweight markedly porous wood with long wood fibres. Cedro is easy resounding wood which is very suitable for nylon string guitars (it produces a lot of high frequencies). It is not very stiff in flexure therefore it isn´t used to the steel string instruments. Walnut - is typical material of Gypsy guitar necks. It is used for its nice wood figure in other cases. Wenge - is very strong and heavy wood exclusively used for bass guitar necks. Substances contained in Wenge are very excitant allergen. It can be hazardous wood for allergic people. Rosewood - isn´t typical material for guitar neck. Rosewood is used for electric guitar necks for its acoustical characteristics. It is very heavy wood. It is very rare wood for its expensiveness. Adjustable - it is a steel rod that runs inside the neck and has a bolt that can be used to adjust its tension. A change of the truss rod tension makes the neck deflected or straightened. There are two types of truss rod - one-way and 2-way. One-way truss rod makes actively in one way only by means of screw and nut. It is possible to tighten a screw or slacken a screw. 2-way truss rod makes actively in both ways by means of two screw threads -left-handed and right-handed- and two nuts with the oposite threads. 2-way truss rods are more effectively and more stable than one-way truss rods. Non-adjustable - it is reinforcement made from graphite fiber, steel, hard aluminium or hard wood. It can be T-section, square, triangular or round profile rod. Prochazka Custom Guitars uses the combination of adjustable and non-adjustable truss rods. This combination is very stable and helps to adjust the neck optimally. Non-adjustable truss rods support the sustain. Fingerboard - Ebony, Indian Rosewood, Brazilian Rosewood, Maple, Wenge, Bubingo any many others types of hard wood are used. There are three principal characteristics of the fingerboard: mechanical ruggedness, tone characteristics and wood appearance. Frets - are very important parts of the guitar. Fret dimensions: the proportion of width and height have effect on tone colour - wide frets cut the high frequencies (bass and electric archtop guitar), narrow frets support the high frequencies (electric and acoustic guitars). Brass - very soft - used in former times. You can find it at very poor guitar nowadays. German Silver - nickel silver alloy - today´s most often material. There are a lot of hardness variants. The high-quality fret wire has 200 HV (Vicker’s hardness Test). EVO gold - copper alloy, nickel free. Hardness 250 HV. Stainless steel - hardness 300 HV. The harder frets produce the higher frequencies. The harder the better - is not useful always.